I have asked a question about my 4th great grandfather Francis Green previously as Finding late 18th Century service record of Francis Green in Cornish Militia? the 1851 Census, born about 1767 (his age is difficult to read and may be 84 or 64 but the latter would make him aged 11 when married!) at Falmouth, Cornwall. Despite that baptism being in about the right place, at about the right time, with a name that conceivably could be shortened to Francis Green by accident or design I considered this to be a long shot until I started to think about why his second son was baptised John Soil Green (20 Nov 1803 at Brixham, Devon). His first son William Woodley Green, baptised 14 Feb 1799, at Lustleigh, Devon, has a middle name matching his mother's maiden name, so I thought it likely that Soil might be a family name too. These first two children from the marriage were followed by nine more baptisms, and only the last two of those were given middle names: Joseph (1806), Francis (1806), Henry (1808), Henrietta (1816), Charles (1816), Cordelia (1816), Amelia (1818), Matilda Grace (1821) and James Woodley (1826). Those last two middle names match the maiden name of their mother Grace Woodley. It strikes me that Mary's maiden name of Sowell and the middle name of Francis Green's second son John Soil Green could be two variants of the same name. My current theory is that Francis Tolvert Greenway baptised 1774 at Falmouth and Francis Green who married Grace Woodley 1798 at Totnes may be the same person. To try and disprove that theory I have looked widely for records of a Francis Tolvert Greenway (or a Francis Greenway with or without middle names like Talbot because his sister Mary's middle name was Tolbot, and his maternal grandmother's maiden name was Talbot) beyond that baptism record, and have found none. It seems like the childhood of Francis Tolvert Greenway was tragic because, when aged about 4 years, he lost two sisters (aged 3 days and 2 years respectively) and his mother within the space of about 19 days. Presumably, he was then brought up by his father. If Francis Green is the son of William Greenway then it is unsurprising that Francis' eldest son is named William. Would the above body of evidence be approaching that needed to meet the Genealogical Proof Standard necessary to conclude that Francis Tolvert Greenway baptised 1774 at Falmouth is the same person as Francis Green who married Grace Woodley 1798 at Totnes? This image is the clipped signatures of Francis Green and Grace Woodley from their marriage record at Totnes, Devon (where both were of the parish, and Francis was recorded as being in the Cornish Militia). From this simple gauge it appears that both were literate. Francis Green's home life was not always harmonious because The Royal Cornwall Gazette of 24 Oct 1856 reported that Francis and his son Francis had been assaulted by their son and brother Charles. These locations, events (including a birth estimate of 1770) and dates are mapped below and seem to support Francis having been born in Cornwall (Falmouth is the only place named for this event, and that was in the 1851 Census, the 1841 Census just says Cornwall), having been part of the Cornish militia for at least some, and I suspect all, of the 6 or so years that he lived in Devon, and then returning with his wife Grace and at least two children to Cornwall, where he spent the rest of his life around Truro (St Clement and St Mary). I think you may be barking up the wrong...er...family tree. To me this doesn't add up, and certainly more evidence is needed before concluding that Francis Green and Francis Tolvert Greenway were the same person. You need to explain why the surname may have changed from Greenway to Green, yet Francis still passes on family names as middle names to his children? Possible explanations are adoption, estrangements, inheritance, illiteracy, etc., but none of these are very plausible to me in this case. A simple gauge of literacy is his signature on his marriage record. It's only two words, but if neatly written then that suggests he could probably read and write, and be unlikely to have changed the name 'accidentally'. The dates don't seem quite right. Yes, the 1841 census gives his age as 65, but this census is notoriously inaccurate as far as ages. Enumerators were supposed to round down to the nearest five. Even so, they were often incorrect. The other records you have seem to indicate he was the better part of a decade older. Check Francis's marriage record for any hint. Witnesses? Abode? Check for wills in the Green, Greenway, Soil, Sowell families, from Falmouth and nearby parishes. One of these could be key to establishing a relationship, if any. Keep in mind, the birth place given on the 1851 census might not be accurate. It could just be a place he lived in childhood, or an early place he remembered. 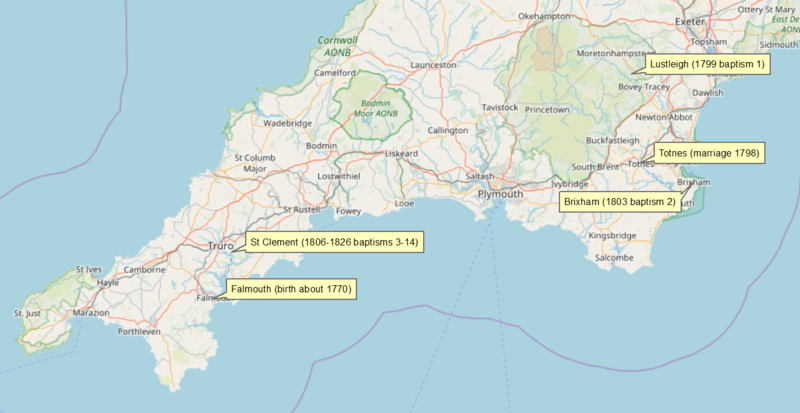 Also keep in mind that not all children were baptised, or baptised in their parish of birth, so not finding a baptism in Falmouth does not necessarily mean he was not born there. A significant percentage went unbaptised, for some later figures see What proportion of the births or baptisms of children were recorded in early nineteenth century England? I would caution relying on naming patterns as the primary evidence. Yes, they are good stepping stones to establishing links, but on their own are just a tiny piece of the puzzle. I can't rule out that Francis Green and Francis Tolvert Greenway are one and the same, but based on what you have written I don't see much that strongly supports this theory. I think the timeline above helps to provide a clear link between John Soil/Sowell Talbot Green (1803-1884), his father Francis Tolvert/Talbot Green/Greenway (1774-1860), paternal grandmother Mary Sowell (1754-1778; who married William Greenway in 1774) and Mary's mother Mary Talbot (born 1725; who married William Sowell in 1754) and now provides much stronger evidence that the Francis Tolvert Greenway baptised 1774 at Falmouth is the same man who married Grace Woodley as Francis Green in 1798 at Totnes. Intriguingly, from AncestryDNA, both my sister and I share 7.5 centimorgans across 1 DNA segment with an individual, whose paper records can be traced to Mary Talbot's parents (our 7th great grandparents) Francis Talbot and Mary Ford who married on 25 Dec 1721 at Falmouth, Cornwall via their daughter Thomasin. I also share 6.9 centimorgans across 1 DNA segment with another individual, whose paper records can also be traced to Francis Talbot and Mary Ford via their son John. Not the answer you're looking for? Browse other questions tagged england 18th-century cornwall proof or ask your own question. Finding identity of Eliza Ann Wills who witnessed marriage of Grace Martin Wills and Matthew Nettell in 1865 at Redruth, Cornwall?